A holistic approach to climate change adaptation requires actions on local as well as on the national level. For each level there are specific tools to assess and monitor adaptation results. Some tools can be applied on both levels or provide guidance on selecting suitable M&E methods. These tools are presented here. A decision support tool for the selection of suitable approaches to monitor and evaluate adaptation to climate change. There is no one size fits all approach to conduct adaptation M&E and it is easy to get lost among different M&E frameworks and methods. The Adaptation M&E Navigator helps to select a suitable approach for M&E of adaptation. It outlines a list of specific adaptation M&E purposes (i.e. reasons for undertaking M&E) and matches them to relevant M&E approaches (i.e. relevant ways to conduct M&E). This is shown in the table below (click on image to enlarge). 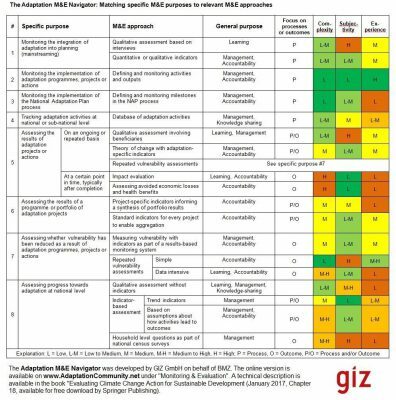 Each M&E approach is then described in a detailed table to enable a comparison among different approaches that are suitable for the same M&E purpose. The detailed descriptions of each M&E approach are accessible through the links under step 2 below. The Adaptation M&E Navigator also refers to further guidance materials and provides examples from practice. This table depicts the eight specific purposes (= reasons for M&E) and suitable M&E approaches to address them. For an enlarged depiction, please click on the image. The Adaptation M&E Navigator can be used online as outlined below. A detailed technical description is available as chapter of the book “Evaluating Climate Change Actions for Sustainable Development” (free download of the Adaptation M&E Navigator). 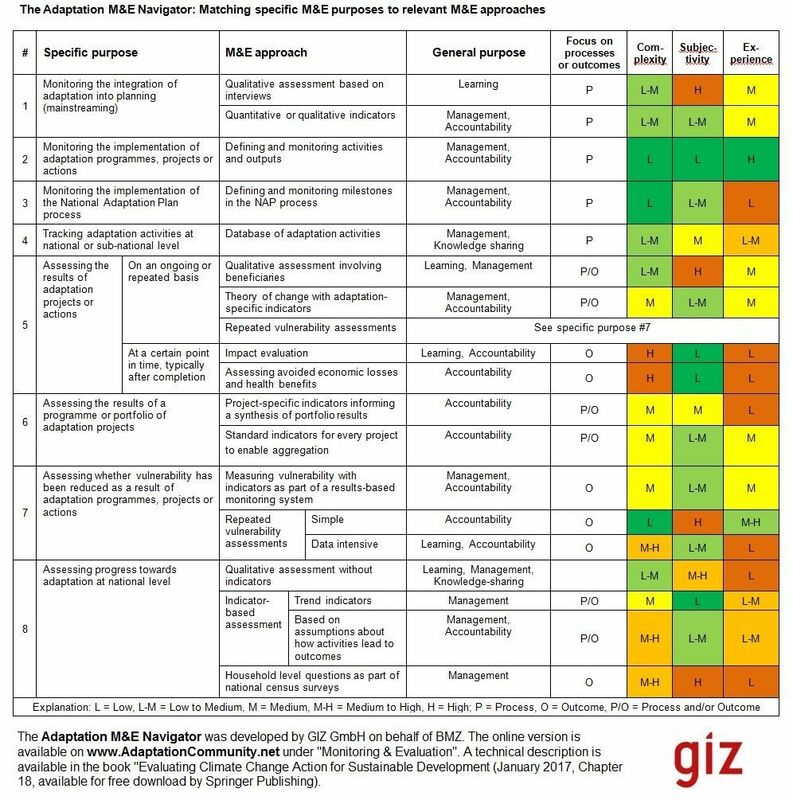 The figure below explains the steps involved in applying the Adaptation M&E Navigator. The blue boxes are part of the Navigator whilst the white boxes take place before and after using it. Each steps is briefly described below. First, determine why you want to do M&E. For example, do you want to monitor the implementation of an adaptation action on an ongoing basis to inform its management? Or do you want to learn why your adaptation action has achieved its objectives or why it has not? The specific reason to undertake M&E is important because it determines how an M&E system needs to be designed so that its purpose can be fulfilled. It is likewise very important to consider the target audience for the information generated by the M&E system. Who should use the information? What communication formats can best reach the target audience? Clarifying the purpose for M&E and the intended users of its information are essential to develop a useful adaptation M&E systems. Each of the five decision criteria are explained in the publication of the M&E Navigator. Based on the provided information, in particular the potential use, benefits and limitations, users can then choose an M&E approach that best fits their M&E context and purpose (steps 1 & 2). Once a decision on a particular M&E approach has been made, the Adaptation M&E Navigator provides practical examples and links to further guidance and resources. Additional know-how might be sought to tailor and implement the M&E approach. Repeating vulnerability assessments over time can indicate changes in vulnerability. This approach can serve as valuable tool for monitoring and evaluating the effectiveness of adaptation if adaptation measures can be linked to the changes in vulnerability. For example, a repeated vulnerability assessment conducted after the role-out of more efficient irrigation systems could indicate whether farmers’ vulnerability to water shortages has been reduced (details of this example from Bolivia are provided in the Annex of the Sourcebook). In this regard, periodically conducted vulnerability assessments can also serve as a valuable input to the call for enhanced transparency of adaptation action and an assessment of collective progress made within the Paris Agreement. The Vulnerability Sourcebook is structured along eight modules which provide detailed guidance on the operationalisation of a vulnerability assessment. A key element is the development of climate change impact chains that specify the exposure, sensitivity and adaptive capacity which together determine climate vulnerability. The approach of the Sourcebook is applicable from national to local level and to a broad range of sectors. It is illustrated with examples and lessons learned from pilot applications in Bolivia, Pakistan, Burundi and Mozambique. 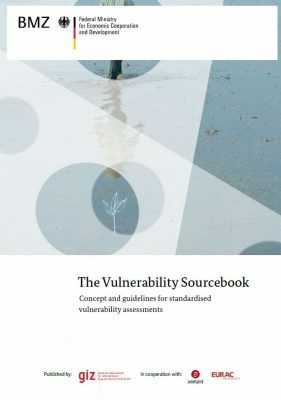 To download the Vulnerability Sourcebook and its supplementary materials please have a look at the this page under the topic of Vulnerability Assessment.